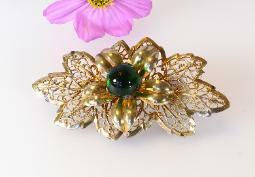 Glamor yourself - Peking Peking Glass brooch, antique Bubble Filigree Glass brooch, signed PR.ST.CO. pin, antique veil pin, paste stones, sash pin. around the pink enamel stems on this important brooch. Glass rs and glass navettes in its blossom. Art Deco collection. Measures 2 1/2" tall x 1 1/2" across. 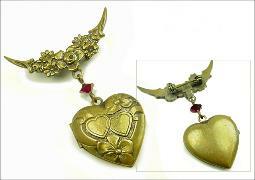 metal, and dangles from a bow and an openwork rectangle buckle. pin stem extending outward on reverse. each side. The c-clasp (has a slight bend). Measures 1 1/2" x 3/4". Est. c. 1900.
measures 1 1/2 inches tall. amber glass gemstones. The brooch is marked on the backside 95 and has a c tube catch. Measuring 2" in length x almost 1 1/4" in width. 1895.
colored glass stone set opened back. There is a slight bend in the pin on the backside. inches x 1 inch. 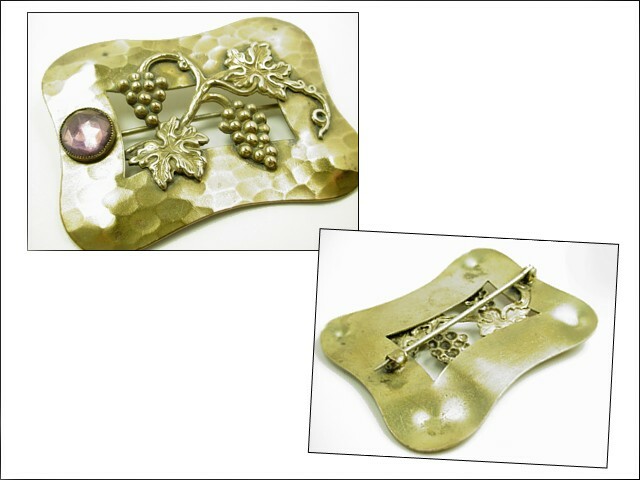 C-clasp closure. back. 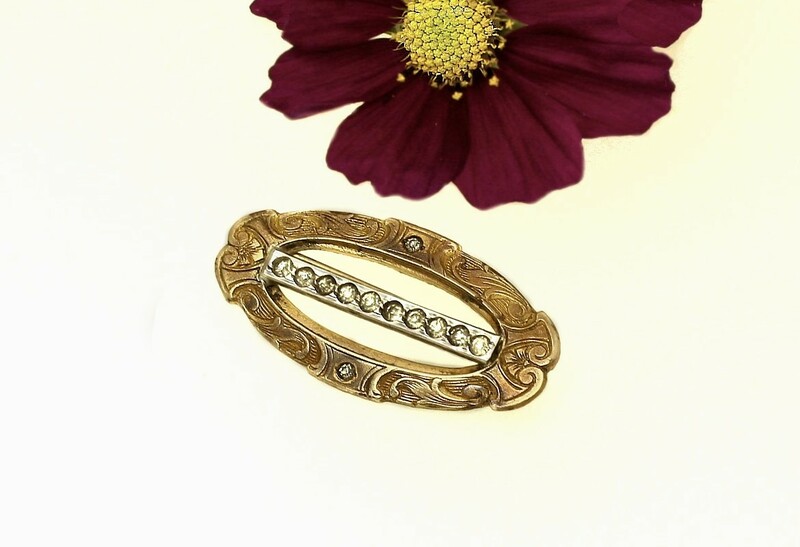 Guaranteed old and original, antique victorian brooch. 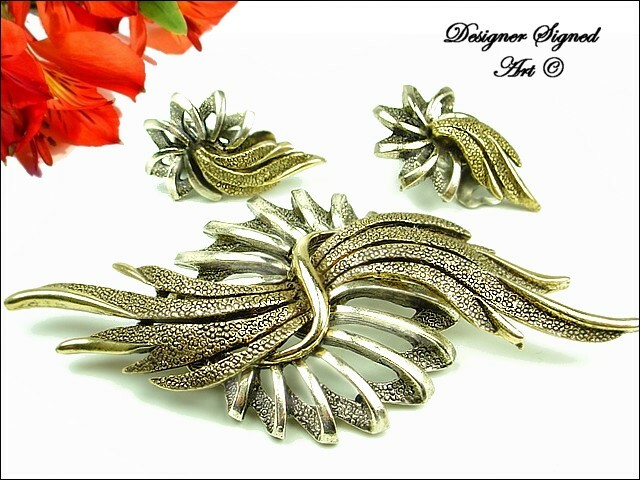 Vintage designer signed "Art" Brooch Demi and Matching Earrings, Large & Stunning. Impeccable. c.1950s - 1960s. on backside. 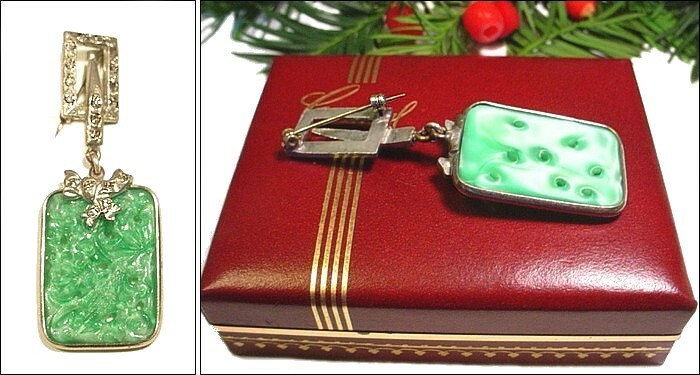 Matching two tone clip earrings measures 1 1/4" long x 3/4" across. 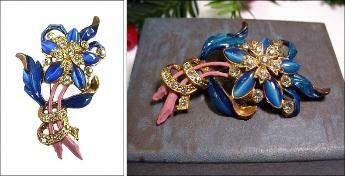 matching clip-style earrings. 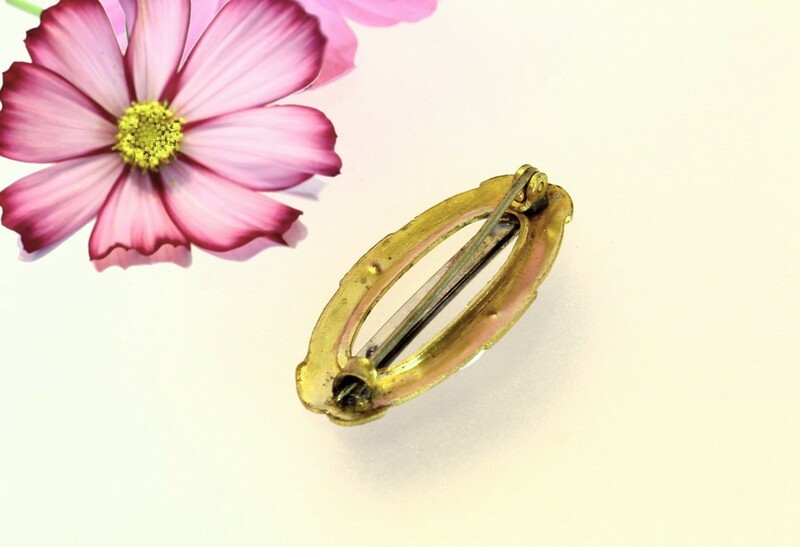 The pin is 3 3/4" x a 1/2". The earrings are 1 1/4" x 7/8. 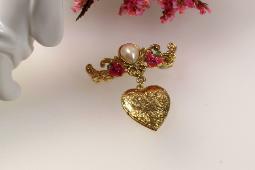 pearl with 2 enamel pink flowers, shinning and in excellent shape. 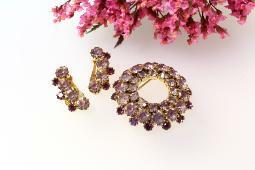 1 1/2" across x 1 3/4"
brooch is enhanced with purple chatons that are spaced evenly around. 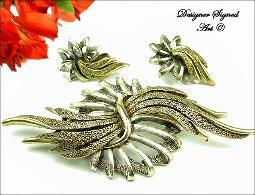 Matching curved clip earrings, 1" in length. antique Bubble Filigree Glass brooch, signed PR.ST.CO. 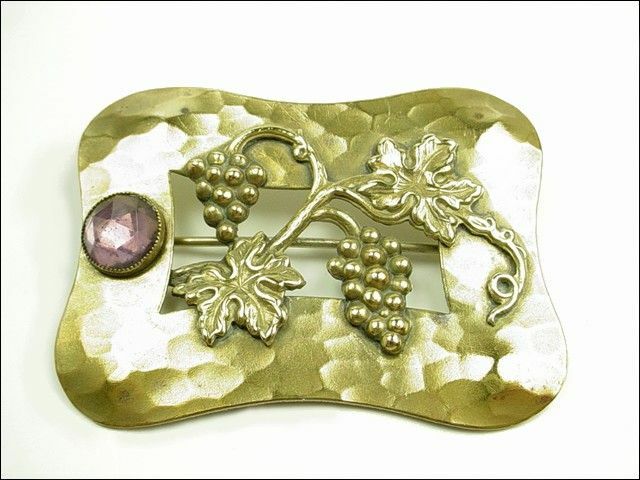 pin, antique veil pin, paste stones, sash pin. 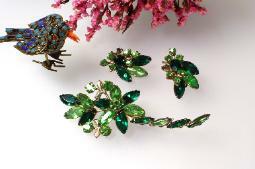 Antique jewelry and vintage brooches. 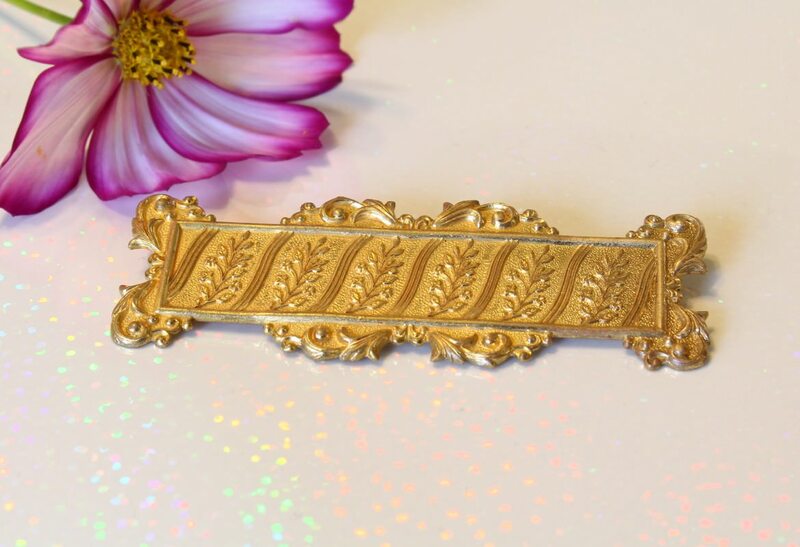 Victorian brooch, antique brooch, and vintage brooches.